Each Christmas, Santa Claus reemerges as a cultural icon of the holiday as millions of shoppers spend billions of dollars on food and gifts. But who was the real Saint Nicholas? What story has been lost behind the frenzy of the Christmas season? What were the principles he believed in and taught to everyone around him? The True Saint Nicholas unveils the heart and life of a man who lived long ago—yet whose legacy has become an example for people everywhere, calling listeners to a higher order of generosity, caring, and devotion to others. 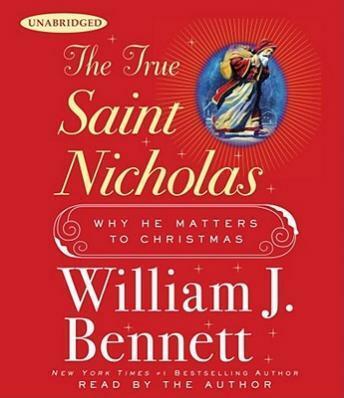 William J. Bennett reveals how Saint Nicholas’s selfless giving originated in third century Turkey, and how it remains relevant to our lives today. His is a story of devotion to God and an example of eternal goodness. This historical, yet charming rendition of the origins of the modern-day Santa reminds us of the importance of virtue and reacquaints readers with the true meaning of Christmas.